Epotec is a hi build coating and can generally be considered both water and vapour proof. This means that neither liquid water nor water vapour (gas) can pass easily through the coating when applied at the correct film thickness. Concrete is a hydroscopic material meaning it tends to absorb moisture like a sponge. If humidity on one side is different to the other, it will transmit moisture as liquid or gas, through the concrete. Hydrostatic water pressure: Hydrostatic or “head” pressure is the force caused by a column of liquid water, which generally does not harm solid concrete. However it will force itself through as a liquid, even in quite dense concrete, especially if there are imperfections such as sand streaking, honey combing, cracks and areas of lower density. Higher water – cement ratio concrete (<0.40) tends to form more permeable concrete, with lots of capillaries being created. Hydrostatic water pressure is only a problem when liquid water is in direct contact with the concrete mass. Water Vapour: Water vapour (gas) molecules (not liquid) can more easily pass through mass concrete and they are much smaller and compressible too. This tends to be more of a problem in areas of high water table, or where the water proof membrane (if installed) has failed. What causes the Water Vapour to move within concrete? As gases can change shape they can wiggle through tiny voids as small as 5 micrometers. The gas is harmless to the concrete, however when it condenses into water it takes on a much bigger size. As the concrete cools (such as in winter – pool water cools) its ability to keep the water vapour in a gaseous phase diminishes and it condenses into liquid. This “new” water will have a pH of 7 which allows it to attack other molecules in the voids including weak cement ions and this continues enlarging the void. Over time the destructive effect grows and other molecules previously bound to the now missing cement molecules, are affected. When these voids are near the surface of the concrete, large voids cause the de bonding of the surface of the concrete and any coating attached to it. Also when vapour turns into liquid, another force is created called capillary action. The “new” water is attracted more to the surrounding surfaces (inside of voids) then to itself. Meaning it can move around both vertically and horizontally within the pores and capillaries in the concrete. As this water gets near the outer deteriorating concrete surfaces just below the coating, it will often force the coating to blister or bubble just before final delamination. These can be from rain runoff, such as when water absorbed into the soil near the pool and runs past, under or around the pool and in so doing saturates the pool structure. This can be seen on pools on hillsides and near to buildings where the collection of water from nearby areas is channeled to areas around the pool. Pathways, patios and lawns near pools are also ways to generate large areas that saturate ground with rain runoff, causing the pool to get “wet feet.” Sometimes we find leaking plumbing can also be a cause, especially if blisters near to outlets below the water line. Showing telltale efflorescence on tile grout indicating water passing out from pool shell. Effects of poor drainage around pool and causing in part delamination of render. Fortunately in our experience it’s not a common problem as most pools are well constructed and in dry areas. 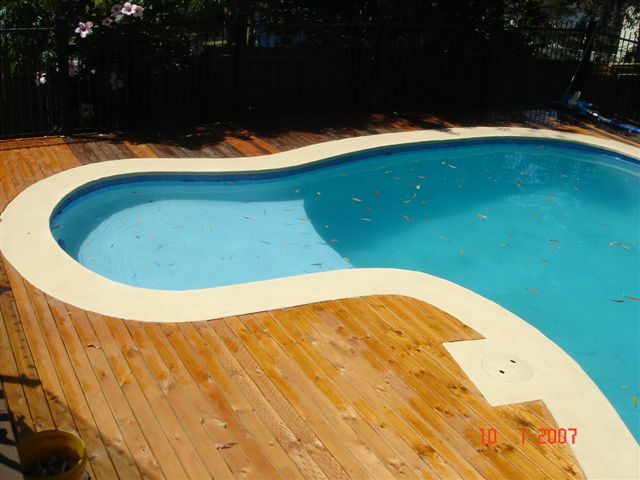 Often in pools painted with thick coatings, if there is to be an issue with this, it will show up after some time. (Months to years) The exception is when heavy rain has occurred soon after application and the ground is wet. (higher water table). Also more often than not it will be seen first on pool walls that face North to North West (Heated by sun generating higher temperatures and causing more water vapour activity within the walls). It may also happen on other walls if they have areas of porosity within, including cold concrete – render joints. To check, drop the water level enough to expose some blisters. Carefully prey open with a sharp knife. If water comes out (maybe dark in colour) it confirms hydrostatic pressure is the cause. Sometimes blisters are seen on the pool floor but this is usually long after it’s seen in the walls. Pool surrounds (coping and paths) that are dark coloured also impact on the rate of activity as they absorb more heat from the sun, drawing moisture up the walls to the top. Why do I see it on my pool now? If the pool was not coated, but had a rendered surface or Marblesheen or Pebblecrete finish, these are all quite porous and the effect will have been going on but as they are porous surfaces no noticeable defect occurs. Even if a painted pool before, the then paint film may be quite thin (porous) or worn away so the effect will not be easily seen. This issue largely arises and is noticeable when an impermeable coating is applied. Such coatings make for a much easier pool surface to keep clean as algae and dirt don’t stick, but may have this drawback. If so these should be attempted first. If not appropriate or not relevant to your pool, then consider the climate and in some cases recent above average rainfall. If this is the likely cause, then maybe best to leave the pool as is for a few years until the weather patterns are dryer (rainfall tends to be in cycles) then empty, prepare and recoat. If you follow this suggestion the blisters may continue to develop during the few years while you wait and then slow down as the hydrostatic pressure becomes less. The blisters may break and yes allow water into the structure which helps the equalisation somewhat. However be aware that the blisters may return after the pool is recoated. The other way is to consider a permeable finish that will allow this hydrostatic situation to continue, unheeded.